The one-click installer of WordPress Toolkit does everything from start to finish – downloads WP, creates a database with a database user, creates an admin account in WordPress and initializes WordPress. You can clone your website and set up a staging environment to test new features and new ideas without affecting your website. Scan al your WordPress sites with Plesk, to identify threats and protect sites. No manual work needed. Simply check websites you wish to harden. Click “Secure”, and you’re done. For all Web Hosting Plans: Monthly Contract, Monthly Billing, Cancel Anytime. *Unlimited Bandwidth: HostAfrica reserves the right to reduce the bandwidth in cases of extensive use. Contact us if you have a question. 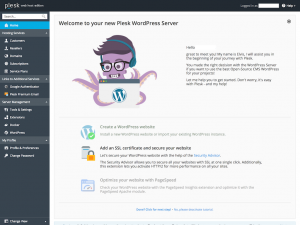 Why Plesk WordPress Server Solution ? The Plesk WordPress Hosting is ready to deploy out-of-the-box configurations that come with pre-configured settings and our top extensions pre-installed, focused on all you need to manage your WordPress environments – optimized. Plesk WordPress Toolkit allows server administrators, resellers and customers to manage their WordPress instances, enabling a variety of development workflows for WordPress admins of all skill levels, from beginners to pros. What are the advantages of WordPress hosting? Our security team at HOSTAFRICA ensure that your WordPress websites are as secure as possible. Firewalling, fail2ban and server hardening are all used to ensure that your website stays secure. Can I create email accounts? Yes, your WordPress product also functions as a hosting package and you are able to create email accounts. What is the difference between a WordPress Server and WordPress Hosting? A WordPress Server package will give you a superior performance to a WordPress Hosting package.